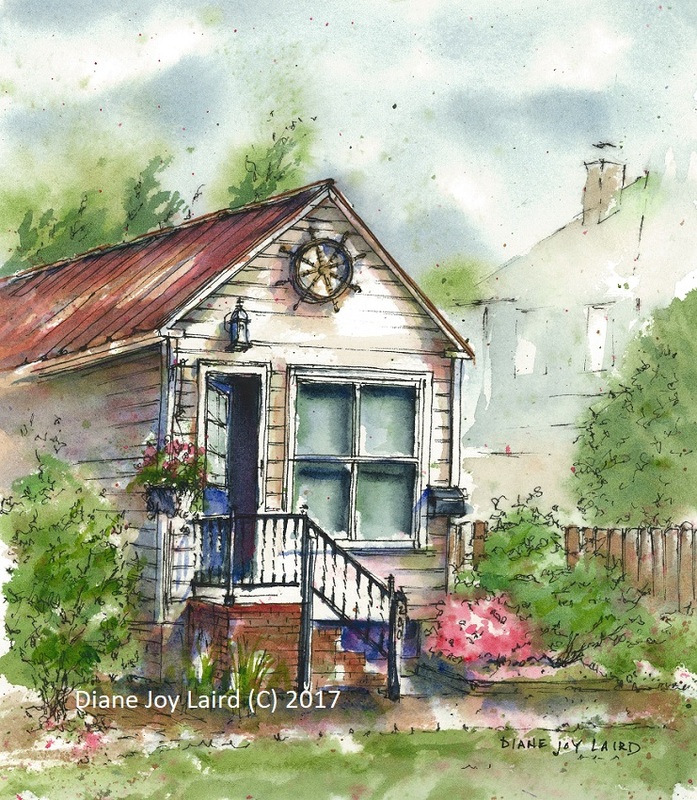 The ships wheel of this little residence was mysterious, and the bright sunlit white contrasting with the blue trim and pink azalea caught my attention during a lazy Saturday morning on Queen Street, downtown Chestertown. Neighbors quietly talking on the phone, a few passersby going to the market, and neighborhood pets going about the morning's activities made for a delightful couple of hours painting outdoors. Please contact the artist if you would like to purchase products related to this image. 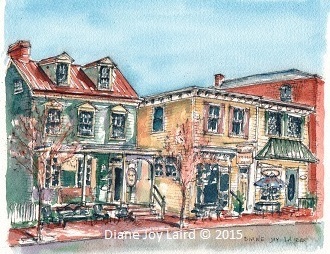 This 5" x 7" painting was created during the Chestertown Art League's 2012 Plein Air Paint Out. It is in the private collection of the artist and remains, to her, an inspiration to paint in Europe at first opportunity! Limited edition prints and note cards are now available. Opening Day! 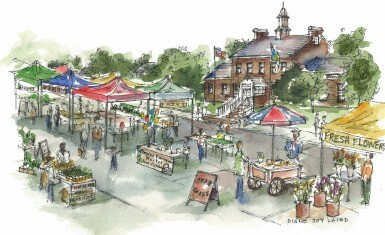 commemorates the launch of the downtown Smyrna Farmers Market in June of 2012 in Smyrna, Delaware. The original 8" x 10" painting is owned by Jim Hawkins who took a leading role in developing and launching this weekly community event. Limited edition prints and note cards of Opening Day! are available. “Opera House in Winter” is a brand new adaptation of “Opera House in Autumn“ ("Smyrna Opera House"). This image is available in prints and notecards, and through December 24, 2014, a pack of 10 holiday greeting cards with the inside message "May your Holiday Season be filled with Joy and Peace." 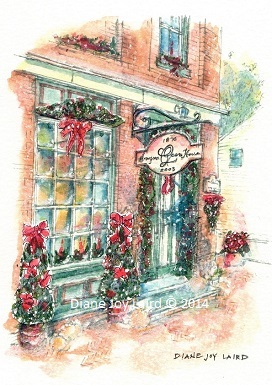 The seasonal greeting cards are also available at Smyrna Cards and Gifts located at 16 South Main Street. For craft spirits tastings in an historic theater with a retrofitted, upscale interior, visit Painted Stave Distilling in Smyrna, Delaware! Prints and notecards available. This painting from a deep porch amidst heavy downpours on the Sunday morning two-hour Quick Draw proved to be a worthwhile undertaking. 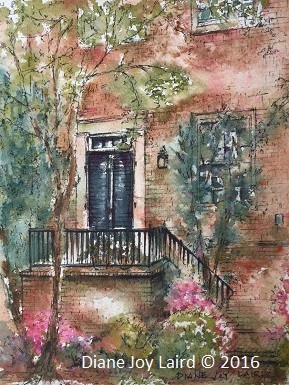 Not only did the vibrant pink and white azaleas against the black and brick architectural features inspire me, but the painting won the "People's Choice" award. April 2016. Original 8 x 10 painting is available. 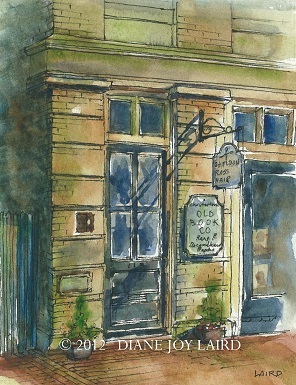 This 12" x 16" original painting of the landmark café, Play It Again, Sam! 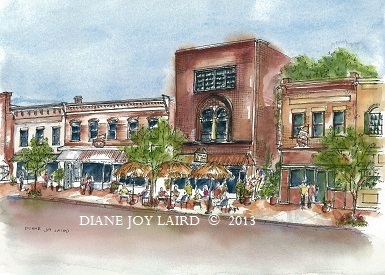 was painted during the Chester River Arts 2013 Plein Air Paint Out and depicts the very enjoyable downtown shopping area at Canon and High Streets. The original painting is currently available for sale. Please contact the artist directly for more information. Limited edition prints and note cards are also available. 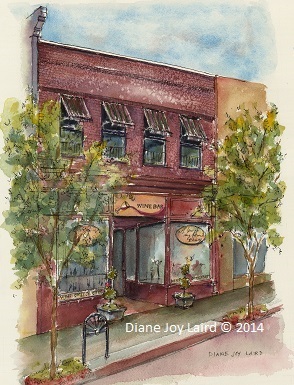 Visit Purple Sage and Immediato's Bistro... two superb local Middletown Main Street businesses. 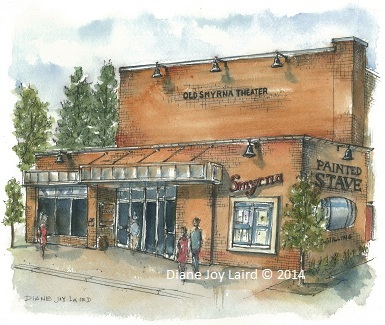 See also the image of the Everett Theatre in Middletown on this website and on the Delaware Images board at Simple Joys LLC on Pinterest. Also available in prints and notecards. 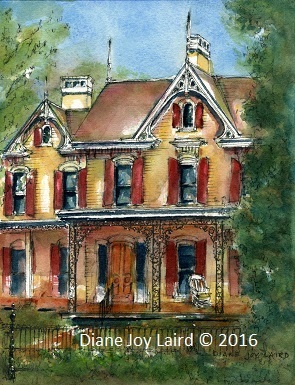 Residence on The Green was painted in a 3-hour timed competition and won second place in the 2012 Kent County Tourism Plein Air Paint Out. 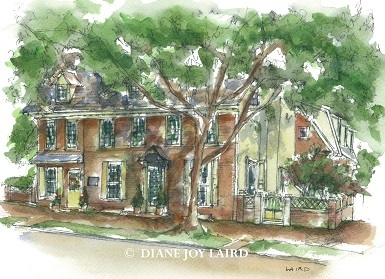 The original painting is owned by the homeowner, Anne Horsey. Limited edition prints and note cards are now available. 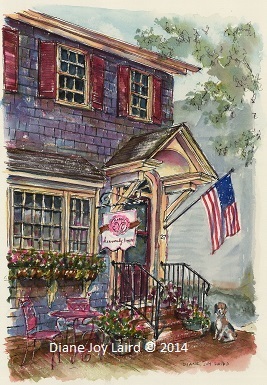 A Victorian riverside house in 2 acres is the setting for the romantic River House B&B in Snow Hill, MD. The original painting is available.